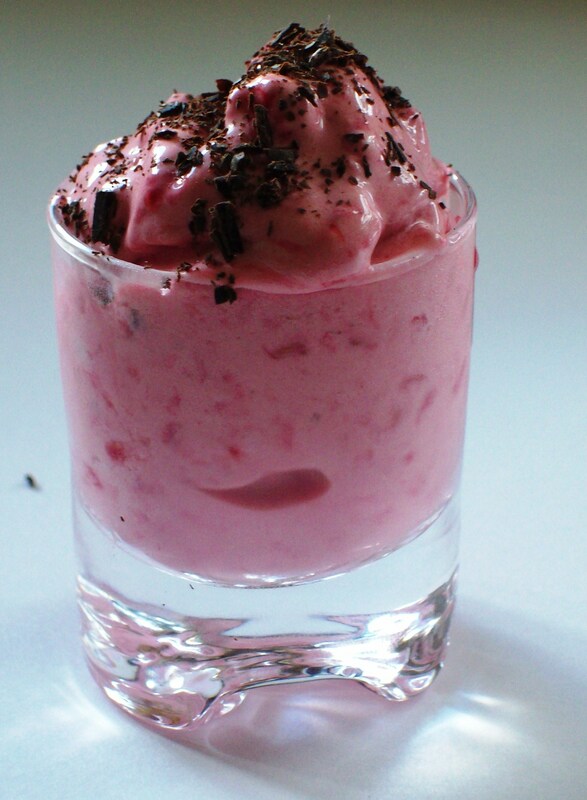 Instant Sugar-Free Low-Carb Raspberry Ice Cream (Egg-Free) - Low-Carb, So Simple! | Low-Carb, So Simple! I was about to write a lengthy post about simple strawberry ice cream but finally wanted to publish something even simpler. This ice cream is so ridiculously simple yet delicious that most probably many people in the world have already invented it — or at least something very similar. You need just three ingredients: frozen raspberries, ricotta and vanilla stevia. Mix everything in a food processor until smooth. You can leave small pieces of raspberries if you want. The need for simple, instant ice cream rose from the fact that my ice cream maker is not the handiest device in the world. The bowl needs freezing at least one day before one can even think of making ice cream. Since I made ice cream yesterday evening and put the bowl back to the freezer this morning, it wasn’t frozen enough. Today was a warm and sunny day and I wanted to have something refreshing without further waiting. Something healthy, sugar-free yet sweetish, and of course low-carb. I’ve tried mascarpone when making ice cream and wasn’t very happy with the result. The texture of the ice cream was a bit flaky, or at least not extremely smooth. Mascarpone also left some kind of a greasy layer on the tongue. So I had to try out something else. Heavy cream would be too fluid and, well — heavy. I thought to give another try to ricotta which I’ve also tried before when making ice cream with the ice cream maker, even I wasn’t very happy with the result. Here however, the ricotta suits very well. 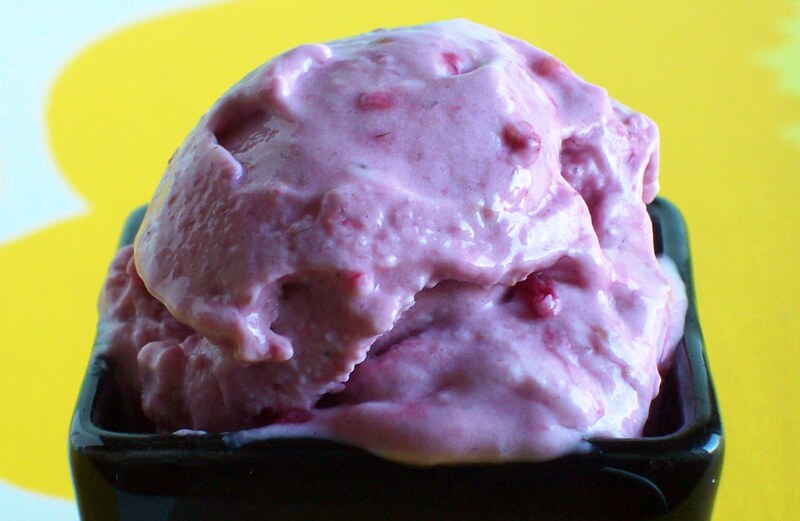 It gives the instant ice cream a fresh note without being too light or too heavy, or too greasy. Maybe I’ll give a try to sour cream as well in the future when I happen to have it in my fridge. My mom took the last jars when visiting us last week and I didn’t manage to buy more so far. I would need to go downtown for good and cheap sour cream. In addition to ricotta and sour cream, Turkish yogurt or quark (curd) might work well for an instant ice cream. I’ve used vanilla stevia as sweetener for this ice cream. 30 drops doesn’t give very sweet taste, but a nice refreshing touch with a hint of vanilla which is ideal for a hot summer day when you don’t fancy anything too sweet. But as always, please feel free to use your favorite sweetener and other flavors in case you want to. Now when I’m thinking of other flavors, adding cocoa powder or dark chocolate or even tiny 100% chocolate shavings to this raspberry ice cream sounds really good. Or instead of vanilla stevia maybe chocolate raspberry stevia which I also happen to have in my pantry. In case you tried out this Instant Raspberry Ice Cream, please feel free to tell what did you like, and if you did any modifications. Or, if you have a recipe for instant ice cream, please feel free to share the recipe or link here! And next, the lengthy post about the easy to make strawberry ice cream which is a real mouth-watering (actually mouth-cooling!) delicacy. Stay tuned! Update June 8th, 2012: I tried this instant ice cream with sour cream instead of ricotta, and the result was really rich and delicious! Highly recommended! Hello, thanks for posting so many lovely recipes. My question, will the instant Raspberry Ice Cream keep at all or does it have to be eaten straight away, thanks. Hi Debra, great to hear you like my recipes! It’s better to eat the Instant Raspberry Ice Cream straight away, but you can also store it in the freezer. Naturally, it gets stone-hard and frozen, so you can take it from the freezer 15-30 minutes before serving and mix thoroughly so that the consistency is like soft ice. Hope this helps!